Whether you’re traveling alone or with family or friends, the Bird-in-Hand Family Inn offers something for everyone – and easy access to the attractions of Lancaster County. We offer 125 clean, comfortable rooms with many conveniences and amenities. Your stay with us includes access to our recreational facilities as well as a complimentary guided tour of Amish farmlands. Choose from a variety of double, queen or king rooms, plus one- and two-room and efficiency suites. Don’t miss our recently remodeled Village Rooms, including our unique Schoolhouse Suite for an immersive Amish Country experience. No matter which you choose, you’ll enjoy a variety of in-room conveniences, a wide range of recreational facilities – and a warm Bird-in-Hand welcome. For any unique needs or special requests, please call us directly at (717) 768-8271. Start the day with a refreshing swim – or end it with a relaxing soak in our hot tub. The standard queen rooms in our pool building give you and your family easy access to our indoor and outdoor pools, hot tub and game room. You’ll enjoy resort-style convenience and the simple comfort and cleanliness of Amish Country hospitality. Located on interior corridors, these rooms each feature two queen beds and a standard bath, along with such amenities as a table and chairs, flat-screen television, in-room refrigerator and free Wi-Fi. Combine quaint, cozy Amish Country décor with contemporary conveniences and plenty of space, and you’ll have a king room in our pool building. These oversized rooms are spacious and more than comfortable with an outstanding array of in-room amenities. Each room features a king bed, desk and comfortable seating. In the bath, a tub with whirlpool jets lets you soak away a day of shopping and sightseeing. Other conveniences include a flat-screen television, DVD player, in-room refrigerator and microwave and free Wi-Fi. Start your morning with a hot cup of coffee while you’re still in your robe. The deluxe queen rooms in our pool building include those little extra conveniences – like a personal Keurig coffeemaker, an in-room refrigerator and a microwave. Featuring a contemporary design enhanced by the warm, homey touches you’d expect in Lancaster County, these rooms offer two queen beds, a writing desk, a 39-inch flat-screen television and free Wi-Fi. Lancaster County offers so much to see and do that you’ll want to stay long enough to take it all in. The junior suites in our pool building are the perfect home away from home for extended stays. These spacious suites sleep up to five or six, with two queen beds and a sofa or futon, and the bath features a tub with whirlpool jets. For your comfort and convenience, you’ll also find a table and chairs, two flat-screen televisions, a DVD player, two telephones, a refrigerator for beverages and snacks and free Wi-Fi. Now this is a vacation! Open the door onto your patio, and you’re just steps away from our outdoor swimming pool. The largest of our accommodations, the two-room family suites in our pool building provide comfortable living space for families, small groups of friends and extended stays. They sleep five to six with one king bed or two queen beds in the bedroom and a queen sofa bed in the living room, and feature a standard bath. For your comfort and convenience, you’ll also find a table and chairs, a recliner, two flat-screen televisions, a DVD player, two telephones, a refrigerator for beverages and snacks and free Wi-Fi. After a day spent splashing in the pool, shopping or exploring the sights of Lancaster County, nothing could be more relaxing than listening to the clip-clop of horses’ hooves along Old Philadelphia Pike or watching a hot air balloon expand and start to soar. The standard rooms in our front building are adjacent to our large front lawn, which offers a beautiful view of the Amish farmlands just across the road. Each room features two double beds, a table and chairs, standard bath, a television, refrigerator for beverages and snacks and free Wi-Fi. You’ll also enjoy ground-floor access and convenient parking. 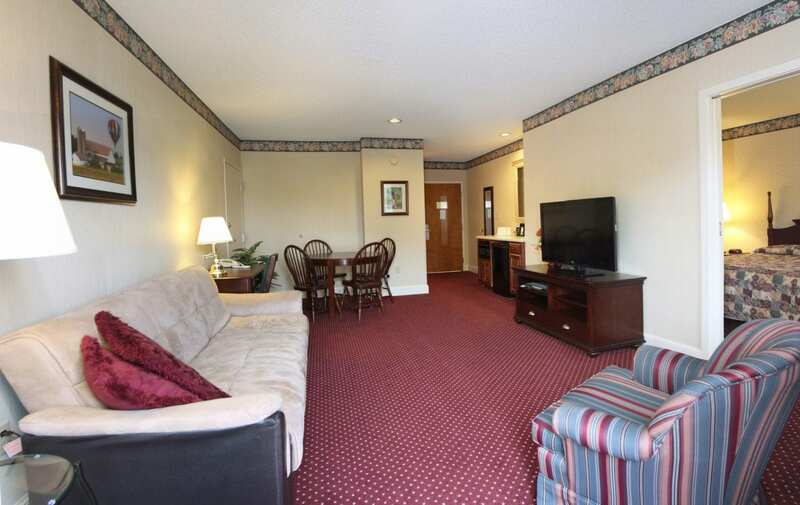 Enjoy comfort and convenience in the heart of Amish Country. Whether you’ve been shopping the outlets or antiquing, you’ll appreciate the easy ground-floor access of the king rooms in our front building. Each room features a spacious king bed, comfortable seating and a standard bath. You’ll also enjoy such in-room amenities as a flat-screen television, an in-room refrigerator for beverages and snacks and free Wi-Fi. If you’re considering an extended stay, the efficiency suite in our front building just might be the perfect fit! It accommodates families and small groups with two double beds and a twin pullout sofa, as well as a standard bath. For your convenience, the suite features a kitchenette with table and chairs, refrigerator, two-burner stovetop, microwave and sink. Other in-room amenities include a flat-screen television and free Wi-Fi. Imagine yourself in a one-room Amish schoolhouse, complete with a teacher’s desk, a blackboard, gas stove, books and a globe. The walls are adorned with authentic schoolhouse artifacts. The Schoolhouse Suite in the Village Rooms is an immersive experience that recreates a traditional Amish school. The theme flows through to the exterior, which features a school bell and a rail fence overlooking our large lawn and the peaceful farmlands beyond. This 450-square-foot suite sleeps up to five. The living area features antique décor and local furniture. It also offers a dry-sink kitchenette and a personal Keurig coffeemaker as well as a pull-out recliner that can double as a single sleeper. The bedroom area has two queen beds, a teacher’s desk, a student desk that serves as a nightstand and a 43-inch flat-screen television. It features a standard bath and includes free Wi-Fi. For larger groups, the Schoolhouse Suite has a connecting door to an adjacent Village king room, which can be rented together with the suite. This is why you come to Bird-in-Hand – to experience the hospitality and attention to detail that have become a Smucker family tradition. Our recently renovated and expanded Village deluxe king rooms feature local, handcrafted Amish-made furniture as well as numerous first-class amenities. Each room offers a king bed, comfortable seating, a writing desk and chair, and a bath with a walk-in shower. A chest/media center holds a 43-inch flat-screen television, and we offer free Wi-Fi. For your convenience, the room is equipped with a microwave and a personal Keurig coffeemaker, so you can enjoy a cup of coffee on your front porch while enjoying the view of our large lawn and the peaceful farmlands beyond. Grab a cup of coffee or a cold drink, sit on your porch and soak in the serenity of the surrounding countryside. Overlooking our large lawn and the peaceful farmlands beyond, you couldn’t ask for a better view. When you’re ready to retire, your Village king room features local, handcrafted Amish-made furniture – a king bed, writing desk and chair, comfortable seating and a chest/media center with a 43-inch flat-screen television. Other amenities include a refrigerator for beverages and snacks, a personal Keurig coffeemaker, a microwave and free Wi-Fi. Quaint, cozy and extremely comfortable, the recently renovated Village queen rooms each have a front porch that offers an excellent view of our large lawn and the peaceful Lancaster County farmlands across the road. Inside, you’ll find local, handcrafted Amish-made furniture, including two queen beds, a writing desk and chair and comfortable seating, as well as a bath with walk-in shower and a chest/media center with a 43-inch flat-screen television. Other amenities include a refrigerator for beverages and snacks, a personal Keurig coffeemaker, a microwave and free Wi-Fi. If you’re traveling with family or friends, you’ll love our spacious Village two-room suites. Recently redesigned, renovated and expanded front and back to 600 square feet, they sleep up to six comfortably. They are furnished with quality Amish-made furniture handcrafted locally, feature many conveniences and offer a great view of our large front lawn and the Lancaster County farmlands across the road. Step in off the front porch into the main living area, which is furnished with two queen beds, a writing desk and chair, comfortable seating and a chest/media center with a 43-inch flat-screen television. For your convenience, you’ll also find a personal Keurig coffeemaker, microwave, refrigerator for beverages and snacks and a sink. A separate sleeping area is furnished with a king bed, dresser and 40-inch flat-screen television. The suite has a standard bath and comes with free Wi-Fi.